Ginger snaps are a tasty, crisp cookie that can be enjoyed on their own, or in other desserts or dishes, especially during the holidays. They are a spicy-sweet treat that have been a popular cookie worldwide for decades. But, can dogs eat ginger snaps? The answer is yes, but they may not be the best choice as an actual ‘treat’ for dogs. Ginger snaps for dogs is not a good choice! Ginger itself is safe for dogs, and can actually be beneficial to your dog’s digestive system, helping with stomach aches, pains, etc. But, ginger itself isn’t actually the ‘star’ of a ginger snap cookie. Instead, the cookies are made of mostly flour, sugar, and other spices to give them their signature flavor. There is usually very little actual ginger in the cookie itself, and it’s rarely natural. Sugar is never a good idea for a dog, but the good news? 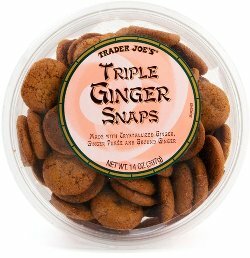 Ginger snaps are actually fairly low in sugar, when you consider the sugar content of other cookies. Plus, the cookies are usually relatively small and crunchy, so offering your dog a ginger snap on a rare occasion as a special treat probably won’t do any harm, and chances are they’ll enjoy the crisp crunch and the sweet taste. Always check the ingredients for xylitol, which is very dangerous for dogs! Ginger snaps and dogs, not harmful but there are better choices! So, ginger snaps aren’t harmful to dogs, at least in small moderation, but they are still made for human consumption, and shouldn’t replace your dog’s actual treats altogether, and should rather be viewed as a ‘special occasion’ treat. How about your dog? What’s his or her favorite treat?